The series itself has a bit of a strange premise. If I were to simplify it down as much as possible, it would be this: A tired salaryman is drafted into an intergalactic war so that he can relive his younger days of playing in a heavy metal band. So this is really a high-concept series, but that doesn’t mean that this can’t also be art. The protagonist of The Legend of Black Heaven is Tanaka Oji. 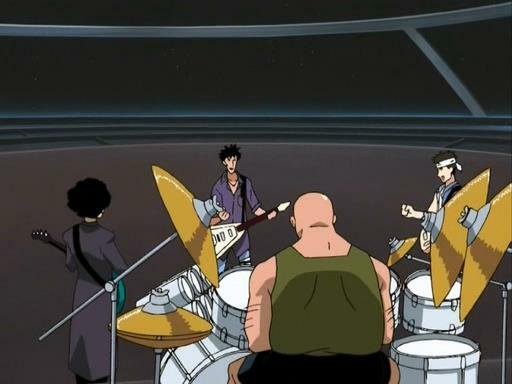 About 15 years before the start of the series, he was in a band called Black Heaven where he was the lead guitarist who went by the name Gabriel. In the present day, he has his wife Yoshiko and son Gen, and the mementos of his youth are slowly being dwindled away. 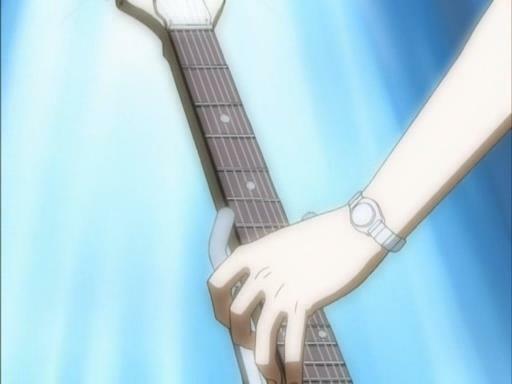 Yoshiko throws away Oji’s last remaining guitar, a Gibson Flying V. He is at the start of the series, just a husk of a man who is just living according to set routines where nothing exciting happens. Then, into his office steps a new co-worker Layla Yuki. She is something different to say the least. With the blonde hair, green eyes and red-framed eye glasses it would be hard not to stand out. She ultimately becomes something like Oji’s agent when she introduces him to the ridiculous premise of the series itself. Oji’s guitar skills are needed to fight a war in space between alien species since they help power the weapons Layla’s side uses. Yes, you might be thinking that this series sounds dumb, but the space battles aren’t really relevant most of the time. Instead, this is really a series about balancing responsibilities. As an example, early on Oji is excited about his opportunities to relive his days of playing in Black Heaven so he wants to leave as often as possible. It’s really quite irresponsible how he ignores his wife and kid to do his own thing for a while. I think that characterization was the best aspect of the series personally. There were times when it would focus on Yoshiko, who would traditionally have been played as sort of a villain trying to ruin Oji’s life as the doting wife, but that’s far from the case here. She is constantly trying to balance Oji’s transgressions to her and Gen with allowing him to express himself. This might be because she is worried that he’s having an affair with Layla, but thankfully she never crosses over into the archetypical disgruntled wife. The second main theme of the series is about artistic expression. 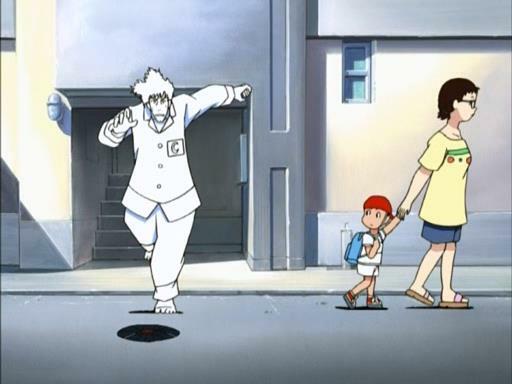 Since this is a late-90s anime with a focus on music, there is a lot of replaying the same loop of music over and over when Oji is playing. As the series progresses, that becomes less effective and he also wants to play new songs, which turns out not to work so well. Then he has to be inspired to play well, but the returns diminish on that as an enemy appears that can cancel out his music, then they need to get the old band back together and that works briefly until there’s a final battle. Like so many things, this series loses its way in the final acts. When Oji needs to get Black Heaven back together it just seemed to work well until it actually worked well in the series. Basically, he got together with them one night over lots of liquor and they agreed to help Oji only for Oji to go around to each person and realize they had other commitments like he did (kids, jobs, etc.) so they were just like he was. Only, they all agree to help him in the end including Layla becoming a substitute keyboard player and they defeat the big bad guy. So my thoughts overall on Black Heaven are this. I enjoyed it for the first 2/3rds of the series and would recommend it overall just for that. The final act was disappointing for just how cliche it turned out to be. I’m glad I watched it, but I don’t know if I would have the overwhelming desire to want to watch it again. I think I would still recommend it to anime fans even if they hate anything old. Wasurenagumo: It’s a visually amazing short funded by the Japanese government which ultimately turns out to be like Monster Musume without the fanservice. Gdgd Fairies: A sort of fun series for those who like voice actresses just having random fun in the recording studio since there’s no plot.